There've been scattered reports of Dell Computer Co. laptops bursting into flames without warning, though there's been little urgency attached to the reports. But in a potentially catastrophic case documented by independent witnesses, a Dell laptop is the primary suspect in a blaze that ignited several boxes of ammunition, sent two tough outdoorsmen running for their lives and left a vintage Ford truck burned to the ground. It all started as Thomas Forqueran and a friend, Rod Riddle, were packing up after a two-day fishing trip at Lake Mead National Forest in Nevada, on July 13, 2006. Forqueran put his Dell Inspiron laptop on the floor of the passenger side of his truck as the two men started packing. Riddle heard a popping noise coming from the cab while loading equipment but was not alarmed until Forqueran smelled smoke. "Flames were shooting about three feet out the window," the 62-year-old Forqueran said. "I ran to the driver's side door and the flames were rushing at me and the three boxes of bullets in the glove compartment. It was extremely accelerated. It was like someone was firing napalm." 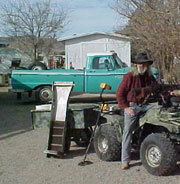 Forqueran screamed to Riddle for water, hoping to save "Jenny," his 1966 Ford F-250. "I could tell by the look of the fire from where I was that there was no way we were going to put out the fire," wrote Riddle in his hand-scrawled witness testimonial. Both men ran for cover as bullets zinged past and the rapidly spreading flames in the cab of the antique truck reached the gas tank. Everything in the truck was destroyed in the subsequent fuel explosion. "Flames were shooting 12 feet into the air above the truck for about 10 minutes," Forqueran said. "There was a very large pillar of black smoke in the sky." Park Ranger Brandon Marsmaker responded to that pillar of smoke. "When I examined the vehicle I noted the remnants of shell casings," Marsmaker wrote in his incident report. "I also noted what appeared to be the remains of a laptop computer. The flame pattern indicates that it started on the passenger side of the vehicle and primarily worked its way back to the bed of the truck. All items inside the vehicle were destroyed by the fire." The flames engulfed Forqueran's wallet, Winchester rifle, GPS unit, cell phone, camera and both men's camping gear -- Forqueran estimates close to $5,000 worth of damage, not to mention a $500 tow. The men were trapped in a breezeless canyon for eight hours in 110-degree heat, with few supplies, before the tow truck finally arrived. By that time, Riddle was sick from heat exhaustion, which had set in that morning -- before Forqueran's Dell Inspiron 1300/B130 set his truck ablaze. Riddle recovered, but Forqueran is still grieving the loss of Jenny, the family heirloom -- a stock 1966 Ford that Forqueran took to auto shows. "I can never replace Grandpa's truck," Forqueran said. "Grandpa bought it new and kept it that way. There were a lot of family memories in that truck. We even installed an outdoor soft water spigot to clean the truck. We always used to say that Grandpa would be turning in his grave if the truck ever got dirty." Although Forqueran's story is perhaps the most dramatic, his Dell laptop is not the only one to combust. The first case of a Dell laptop starting a fire came to public notice when the Inquirer, an online technology publication, posted a story and photos of a Dell laptop exploding at a conference in Japan. The Inquirer published the story June 21, 2006, quoting a witness as saying, "The damn thing was on fire and produced several explosions for more than five minutes." Luckily, only a table and a tablecloth were damaged. Then, on July 25, 2006, engineer Henrik Gustavsson, posted his story and photos of a coworker's exploding Dell on a message board at www.tomshardware.com. According to the TG Daily News, another technology publication, the fire took place in an office in Vernon Hills, Ill.
Coworkers rushed to douse the flames with water and extinguishers. But the flames would not go down. After five minutes, the fire finally died and rescue workers arrived in time to find a smoky office building and crispy notebook and desktop. According to witnesses, all the fires seem to be coming from the Dell notebooks' batteries. Dell, in conjunction with the U.S. Consumer Product Safety Commission (CPSC), recalled about 22,000 batteries on Dec. 16, 2005. But unless consumers with those batteries heard about the recall through the grapevine or happened across the notice on ConsumerAffairs.com or on Dell's or the CPSC's websites, they would not have known about the defect. Dell spokesman Ira Williams said, "I believe more folks are calling us with the issue first." According to the CPSC, "These batteries can overheat, which can pose a fire risk. Dell has received three reports of batteries overheating. The incidents involved damage to a tabletop, a desktop, and minor damage to personal effects. No injuries have been reported." Although it is unknown what models were involved in the two other fire cases reported here, Forqueran's Dell is not one of the 14 models listed in the recall. It also appears Dell might have known about these potentially dangerous batteries two years before they issued a recall. An anonymous Dell insider leaked scores of documents to CRN, another technology publication, that included photographs of dozens of charred and melted laptops, that were distributed to Dell executives years ago. Federal law requires companies to promptly notify the CPSC as soon as they learn of a safety problem with their products. Williams said there is an active "emergency response team" working to discover why these notebooks are combusting. He said he doesn't know how many charred notebooks Dell has received because Dell can't differentiate what notebooks would be classified as burned versus other problems -- for example, he compared it to a broken hinge. Williams would not give a straightforward answer as to whether consumers should be concerned, deflecting almost every question to some variation on, "Safety is Dell's number one priority." Although every known case appears to come from the battery, Williams would not say whether the battery was the culprit. "We hate to jump to that conclusion," he said. Ronald Riley, president of the Professional Inventors Alliance USA, said it has to be the battery. Riley gave two possible reasons for the battery combustion. He said the battery could have an internal short, as part of a manufacturer's defect, causing the battery to explode. He said any number of variables could trigger the flames. He also said it's possible that when the battery gets hot, it "wants" to expand, but has no room. "As the temperature rises, the conductors and plates buckle because they have no room to expand," Riley said. "If Dell used a thermometer that would automatically shut down the computer when the battery gets too hot, this could be avoided. The point is, the computer should not be able to get hot enough to do that." Victims of an exploding Dell laptop may be sorely disappointed if they ask Dell for a replacement. Williams would not say whether Dell would replace any exploding laptops within or outside of warranty, but repeated, "Our issue is less about warranty and more about safety." Safety is Forqueran's issue, too. "I want people to know what happened to me," he said. "These laptops are dangerous and people need to know."